The one and only time I ordered decaf. | The Caffeine-Addict Foodie. The one and only time I ordered decaf. Normally I’m #deathbeforedecaf, but when you’re at the airport, see Klatch Coffee, and remember you need to sleep during the flight.. Exceptions can be made. Trust me, it was a semi-difficult decision. I never drink decaf. Never. I usually consider it a waste of money to pay for a coffee or latte without enjoying the benefits of the caffeine. And, as you may be able to gather by my blog’s URL, a large part of why I love coffee is the caffeine. I love Klatch, but I’ve only been able to go once since it’s pretty out of the way (I’ve only been to their location in San Dimas). Although my decaf iced soy latte tasted great, it really was not the same experience. 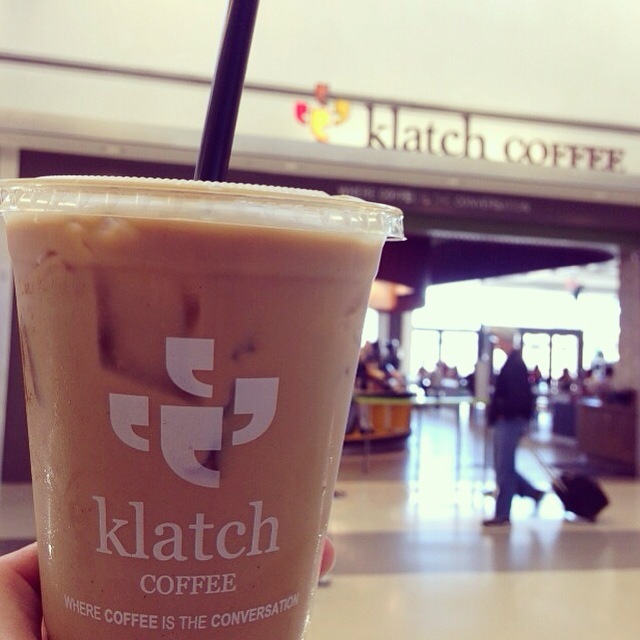 However, Klatch was still a much better idea than any of the other food & beverage options in Terminal 7 at LAX. This entry was posted in Coffee and tagged death before decaf, decaf, lax airport, never again by meaganmcreative. Bookmark the permalink.